A cowboy watches over the longhorn during a cattle drive. The great Texas cattle drives started in the 1860’s because we had lots of longhorn and the rest of the country wanted beef. (We get beef from cattle.) From about 1865 to the mid-1890's, our vaqueros and cowboys herded about 5 million cattle to markets up north while also becoming famous legends that made Texas proud. While Texas had many trails, we need to tell you about two of the most famous: The Chisholm Trail and the Goodnight-Loving Trail. Jesse Chisholm created the famous "Chisholm Trail" in 1865. 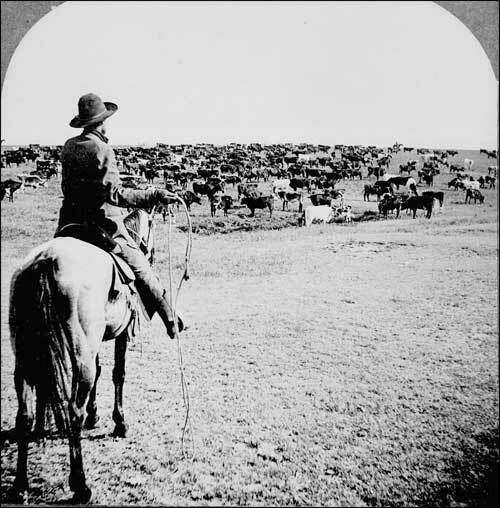 Cowboys and vaqueros brought cattle up north on his trail the first time in 1866. 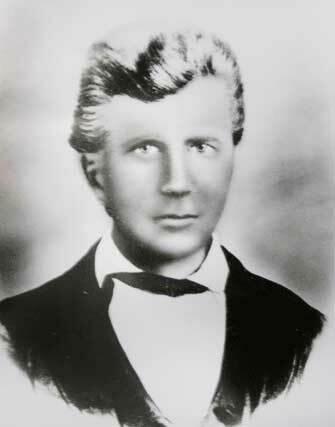 When Jesse Chisholm started his trail in 1865 it began near San Antonio. But by the mid-1870's, the Chisholm Trail started at the Rio Grande (that's where the border with Mexico lies) near Brownsville. It stopped in Abilene, Kansas. On the Chisholm Trail, cowboys and vaqueros had to bring herds across the Colorado River, Brushy Creek, the Brazos River, the Trinity Ford, and the Red River. That's a lot of water, Buckaroo! Why did it stop there? Because that's where the railroads were that could deliver them to other places in the United States. That's also where some of the people were who wanted to buy the cows. The Chisholm Trail was used the most in 1871. But by the mid-1884, the trail wasn't being used much anymore. Why? Because railroads had been built in Texas so the cattle could be shipped from here. That meant cowboys and vaqueros no longer had to bring the cattle up north to the railroads. The Goodnight-Loving Trail became a popular way to bring cattle to New Mexico and Colorado or to start the journey to the west. Charles Goodnight and Oliver Loving created the trail together - that explains the strange name. problem was that between north Texas and Denver the Indians were very dangerous. To solve that problem Charles Goodnight and Oliver Loving came up with a special path. The route was a lot longer than just going straight to Denver, but it was also a lot safer, too! 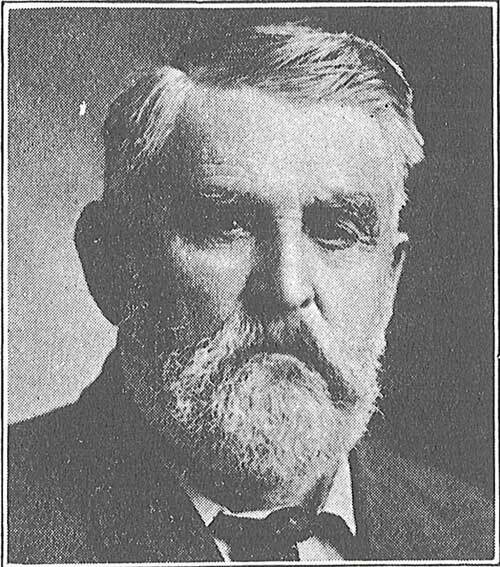 On June 6, 1866, Charles Goodnight and Oliver Loving set off on their first journey to Denver from north Texas, taking 2,000 head of cattle with them. They went via an old Butterfield Stagecoach route to the southwest in order to avoid Indians. 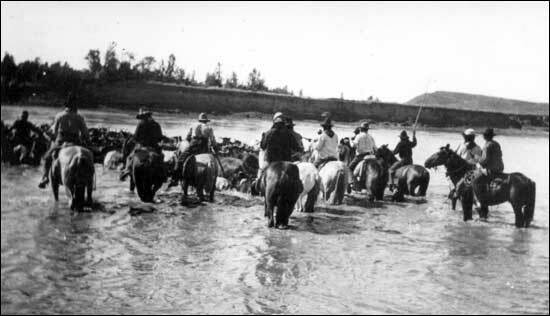 They followed the Pecos River upstream and then went north toward Colorado. When they successfully arrived in Denver with their cattle, everyone realized this was a good route. That's when this trail got named the Goodnight-Loving Trail. The cattlemen took the Goodnight-Loving Trail many times until Loving died in September 1869. How did he die? He died when they were attacked in New Mexico by Indians. Just moments before his final breath, Oliver Loving made his friend Charles Goodnight promise that he would bring his body back to Weatherford, Texas where he lived. Oliver Loving wanted to rest forever in Texas, his home sweet home.